Unwanted hair is a common cosmetic problem for both men and women. 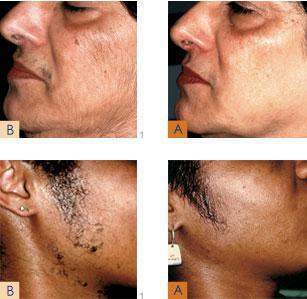 Until recently, the only long-lasting method of hair removal was electrolysis. With new laser technology, long-lasting hair reduction can be obtained from any area of the body. Dr. McMullen and his staff use the Cynosure Elite Laser for fast, painless laser hair reduction. The Elite is unique in having 2 different laser wavelengths, allowing us to treat ANY HAIR COLOR and ANY SKIN COLOR safely and effectively. Hair reduction treatments are sold in packages of 6 sessions, as it generally requires that many sessions to treat hair in the appropriate phase of its growth cycle to see a significant reduction in hair. No anesthesia is required, but we offer a mild topical numbing cream if the patient so desires. Upper lips, bikini line, and underarm treatments may take as little as fifteen minutes. Since no procedure can guarantee permanent hair removal, most patients can expect a 75-90% reduction in hair after 6 sessions, leaving any remaining hairs thinner and lighter in color. You should avoid sun tanning eight weeks prior to your treatments.